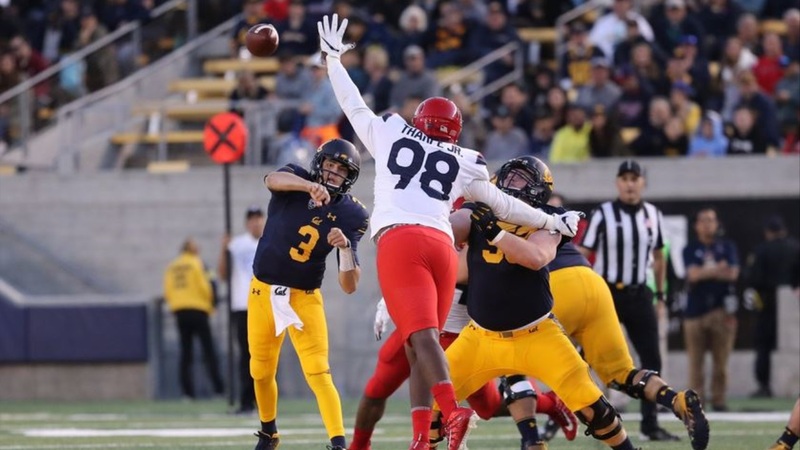 BERKELEY - Justin Wilcox elected to go for two and the win in the second overtime, but Ross Bowers' pass for Jordan Duncan fell incomplete, and Arizona held on for a dramatic 45-44 win over Cal Saturday night at Memorial Stadium. 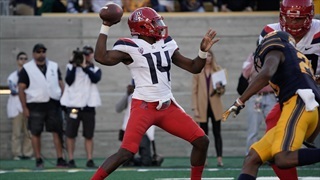 Khalil Tate hit Bryce Wolma for a 22-yard touchdown pass in the second overtime to give Arizona (5-2, 3-1) a 45-38 lead. Vic Enwere answered with a 1-yard TD run on fourth down to bring the Bears within one. 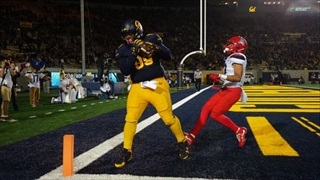 Cal (4-4, 1-4) got the ball first to start the first overtime and Ross Bowers connected with Kanawai Noa for a 13-yard touchdown. Arizona answered in one play, as Zach Green ran for a 25-yard touchdown to force a second overtime. The Bears trailed 31-28 late in the fourth quarter, until Matt Anderson drilled a career-long 52-yard field goal to tie the game at 31 with 1:41 to go. Arizona got the ball back with all three timeouts, but Ashtyn Davis intercepted Tate to preserve the tie for Cal. Tate ran wild in the first half, carrying 10 times for 127 yards and a touchdown. But the Bears defense held him to just 10 rushing yards in the second half and the overtimes. For the game, Tate ran 17 times for 137 yards and a touchdown. He also went 10-of-15 passing for 166 yards, two touchdowns, and an interception. Zach Green added 130 yards and two scores on 20 carries. For the Bears, Patrick Laird rushed for 130 yards and two touchdowns on 28 carries after missing the last game due to injury. He also added five receptions for 42 yards. Enwere carried 13 times for 29 yards and a score. Ross Bowers went 29-of-49 for 301 yards, two touchdown, and two interceptions. He also carried four times for 13 yards and a score. The passing touchdown went to Malik McMorris, his first TD reception of the season. Vic Wharton III hauled in a career-high eight receptions for 96 yards. Kanawai Noa make six catches for 79 yards and a touchdown. On defense, Jordan Kunasyzk recorded a career-high 14 tackles, including two for loss. Gerran Brown and Cameron Goode also set career marks with 10 and nine tackles respectively. Stay tuned for postgame reaction from Wilcox and the players. Its not baseball, there is no inate *overwhelming* advantage for the home team in college football OT. And azz had 3 plays so far in the OT, with 2 TDs, so it seemed THEY had the advantage if anything. Therefore I'm not disappointed in the call to win there and then, it was ballsy. But I'd prefer a play-action waggle if you're going to throw it...those plays suit Bowers better then the straight drop-back. And he just might run it in himself too. Can't agree - Arizona scored 2 tds on 3 plays in OT. It was Cal's chance to win & show faith in your players. One of the biggest unmentioned problems was Ooms snaps - our qb has enough problems not to have his center add to them. Great effort by the Bears - the future is bright imo. What a difference from Dykes! I think we should all tip our hats to a great effort by our players and coaches. We came so close! Exciting game that portends well for the future. There was no difference In going for the two now or in the next OT. In fact we would have been in a disadvantage at the next OT as we were going first. So the decision to go for two at that time was actually the better decision. The issue was he play call - Bowers was not effective in a straight drop situation - he should have at least had a play action or roll out situation where he could have run. But overall a good game and a solid effort. With Downs we win this game. Missing our top players on both offense & defense caught up with us this week. 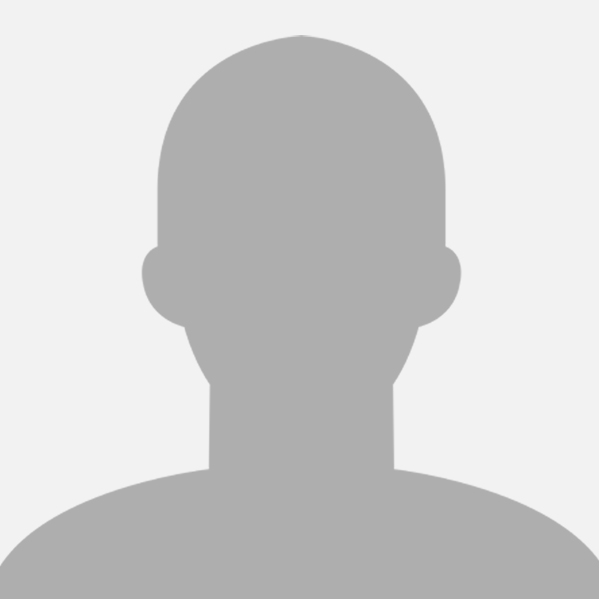 Wilxox & crew just need several recruiting cycles to build depth. Eventually you have to go for two if both teams can score. Wilcox thought about trying to win it all in regulation by going for it on 4th down but opted for the field goal. We had injuries on the O line at the end. This was our best chance to win. The loss was draining, but I can't argue with the call. I think the interception in the end zone in Q2 was killer for us. Yes, we came back, but we outscored them 24-10 in Qs 3 and 4. Had we had that one, it would never have gone to OT. Our halftime adjustments we quite good, with the exception of not knowing their third string RB would step up. We sure shut down Tate's running game. totally agree. 10 point swing that interception wasn't it? pretty sure we gave up a TD on the ensuing drive. I mean in the end, the OT never should have happened. we had too many self induced mistakes. both of Bowers interceptions he had a clean pocket and no pressure. the drops were killer. losing contain on tate in the first half. so many mistakes that MIGHT have prevented OT. If it's the same int I am thinking of, I believe AZ drove the field and then missed the field goal, just before half time. Yup, but we lost 7 or at least 3 and went in the locker room down 14. I agreed with both calls. But the loss hurts. Bad. Such a huge swing factor to the season had we won. Losing Downs (esp) and shuffling OL with 1 week to adjust to the loss against the best running team in conference was the difference. No excuses but It set the table for margin of error. Cant blame Bowers, certainly not coach. We are 4-4 , with 4 to win 2 we can do it. But damn that hurt last night. Beat the Buffs and coach Mac (sorry cant stand him)!